MurMurous Silence was a co-production between Wonderland and As-If Productions from Taiwan for the 2004 Dublin Fringe Festival. It was inspired by the experience of the performer Hsin-I Lin’s mother during the Japanese colonisation of Taiwan and Taiwan’s subsequent fragile independence from China. MurMurous Silence was a theatrical experiment between Lin and sound artist An-Chih Tsai. 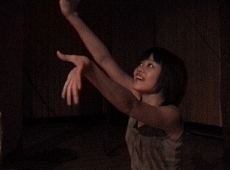 Tsai’s 3D sound space interacted with giant shadow shows and Lin’s solo acting performance, so as to lead the audience through a journey of sensory experiences and personal memory. As-If Productions are minting a nuanced vocabulary of performance.